So thrilled to share that my first solo gallery show is on at the Art in House gallery in downtown Barrie, Ontario. In the summer of 2016 I was invited by Yvonne Ng, director and founder of the Dance: Made in Canada festival (a bi-annual dance festival held in Toronto), to be paired with a choreographer and create responsive textile art works to that person’s dance work – an intriguing challenge! I was paired with dance maker Hanna Kiel, who ended up making a work called Welcome to Our Home – Tangled for the festival. So my starting point for this body of work was Hanna’s description of her choreography, which “explores the strength behind the family bond,” and “questions what makes a family stick together through the thick and thin.” When Hanna and I discussed her choreographic and creative process, she articulated that she also looked beyond family to larger community movements, considering what galvanizes a group to gather and find common ground in spite of differences such as social standing, political leanings, etc. Hanna’s questions around family and community served as my creative kernels as well. I ended up with a collection of pieces that consider areas such as genetics, gathering, and aphorisms-about-family. My time in the studio observing Hanna develop her choreography with dancers in-studio yielded a series of work directly inspired by the dancing I saw that I think of as communicating in code and movement fossils. This body of textile art work was first exhibited in August 2017 on the walls of the Betty Oliphant Theatre in Toronto during the Dance: Made in Canada festival. 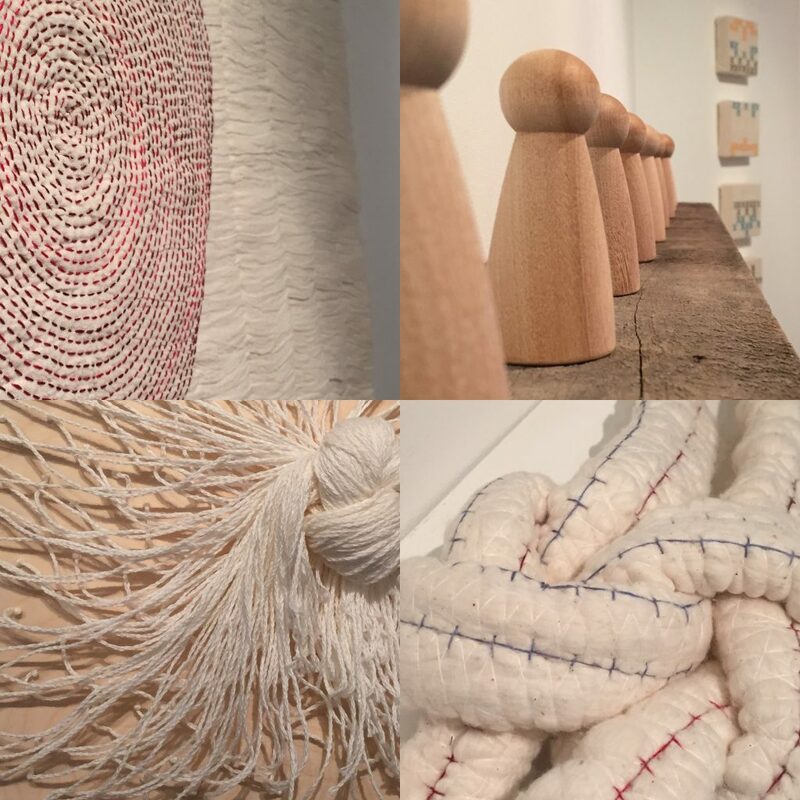 In the works you see here, you can observe my literal and abstract echoes of the theme, thinking, structure, and movement of Welcome to Our Home – Tangled by Hanna Kiel, realized in textiles. 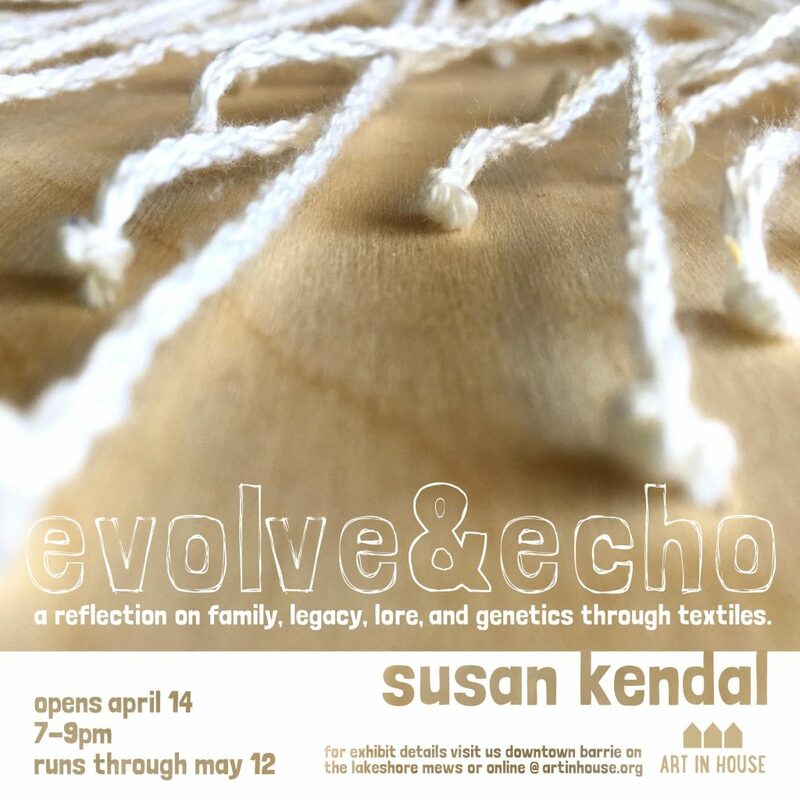 evolve&echo is on at Art in House gallery until Mat 12th, 2018. You can find the location and hours HERE.